Paneldiskussion med Salim Vally, Abir Kopty och Michael Mansfield. Regi: Ana Nogueira och Eron Davidson, USA 2011, 94 min. Engelsk text. 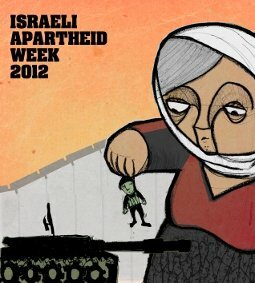 Samtal efter filmen med Michael Deas, europeisk koordinatör för BDS National Committe (BNC) och Israeli Apartheid Week (IAW). INSPIRATIONWORKSHOP – Hur går vi vidare efter Israeli Apartheid Week? Abir Kopty, Mikael Deas, Queers against Pinkwashing Göteborg, Sara Svensson, Erik Helgeson, Salim Vally och Nätverket Isolera Israel deltar i workshopen. Salim Vally, senior researcher at the University of Johannesburg, member of the Palestine Solidarity Committee in South Africa; lived through the apartheid years. Abir Kopty, former spokesperson for Mossawa Advocacy Center for Arab Citizens of Israel and an activist in the Coalition of Women for Peace. Michael Mansfeld QC, Professor of Law at the City University London and a member of the Russell Tribunal.